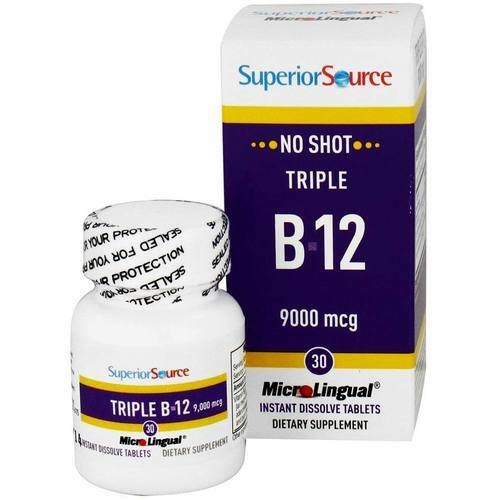 No Shot Triple B12 from Superior Source comes in the format of instant dissolve micro tablets that can be either placed on or under the tongue. Recommended Use: As a dietary supplement, dissolve one MicroLingual tablet under the tongue daily. May also be swallowed as you would a regular tablet. The customer reviews posted below are based on individual consumer experiences and may NOT necessarily represent what expected results will be from using or taking Superior Source No Shot Triple B12 - 9,000 mcg - 30 Tablets. These results may not be typical and you should not necessarily expect to receive the same results. Actual results may vary. It is an excellent concentration for those who performed bariatric surgery, the tablet is small, easy to ingestion. Works as a supplement and helps the skin. A product that helps and a lot of people's health.